Author(s) Mikusiński, Grzegorz; Roberge, Jean-Michel; Fuller, Robert J.
Ecology and Conservation of Forest Birds is a unique review of current understanding of the relationships between forest birds and their changing environments. Large ecological changes are being driven by forest management, climate change, introduced pests and pathogens, abiotic disturbances, and overbrowsing. Many forest bird species have suffered population declines, with the situation being particularly severe for birds dependent on attributes such as dead wood, old trees and structurally complex forests. With a focus on the non-tropical parts of the Northern Hemisphere, the text addresses the fundamental evolutionary and ecological aspects of forest birds using original data analyses and synthesising reviews. The characteristics of bird assemblages and their habitats in different European forest types are explored, together with the macroecological patterns of bird diversity and conservation issues. 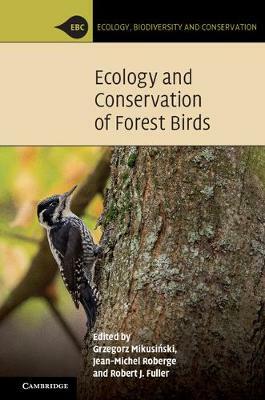 The book provides a valuable reference for ecologists, ornithologists, conservation professionals, forest industry employees, and those interested in birds and nature.